Q: We had cherry pie with vanilla ice cream on Thanksgiving, which inspires this question: Who is responsible for the use of a French expression at even the most humble American diners to describe such desserts? A: The use of the expression “à la mode” to mean “served with ice cream” first showed up in the late 19th century, but it’s uncertain who coined the usage. Despite the uncertainty, you’ll find lots of claims online that one person or another or still another was the first to use “à la mode” in this sense. The three alleged contenders (none of whom we accept) are John Gieriet, who briefly owned the Hotel La Perl in Duluth, MN; Charles Watson Townsend, a diner at the now-defunct Cambridge Hotel in Cambridge, NY, and Mrs. Berry Hall, another Cambridge Hotel diner. Gieriet supposedly used the phrase “à la mode” in the 1880s to describe a dessert of blueberry pie and ice cream. Townsend reputedly used it in either the 1880s or ’90s (depending on the story) after ordering a slice of apple pie with ice cream. And Mrs. Hall is said to have suggested the phrase to Townsend. However, the only evidence that exists for these events is a handful of poorly sourced accounts written dozens of years after the events supposedly took place. There’s no report in writing from the 19th century showing that Gieriet actually served pie and ice cream together, or that Townsend ordered them as a dessert. Etymologists trying to track down the source of a word or phrase look for the earliest written example of the usage, not comments about the usage made years after the fact. The expression was borrowed from French, where it means “in the fashion.” It’s been used in English since the mid-1600s as an adjective to mean fashionable and as an adverb to mean fashionably, according to the Oxford English Dictionary. It’s also been used adjectivally since the 17th century in the name of “beef à la mode,” a dish consisting of beef braised with vegetables and wine, then served in a rich sauce. The earliest written example that we could find for the phrase “à la mode” linked to a dessert is from an article in the April 26, 1893, issue of the St. Paul Daily News about the price of food at the upcoming Chicago World’s Fair, which opened on May 1. However, the article is unclear about what “à la mode” actually meant at the World’s Fair (officially the World’s Columbian Exposition). Did it really mean “served with ice cream” at that time? Not necessarily. An article in the April 6, 1896, issue of the Duluth (MN) News Tribune, for example, has a recipe for “Apple pie a la mode” that’s actually an apple meringue pie, served with a dollop of whipped cream, not ice cream. As we’ve said, there’s no written evidence from the 1880s or ’90s that John Gieriet, Charles Townsend, or Mrs. Berry Hall had any role in inventing or naming pie à la mode. The belief that Townsend concocted the dessert at the Cambridge Hotel and that Mrs. Hall named it was primarily inspired by newspaper and magazine articles published in the 1930s and 1950s—many years after the alleged events. The earliest written source of the Townsend story is an Associated Press obituary for him that appeared in various newspapers, including the May 20, 1936, issues of the Schenectady (NY) Gazette and the Emporia (KS) Gazette as well as the May 21, 1936, issue of the New York Times. 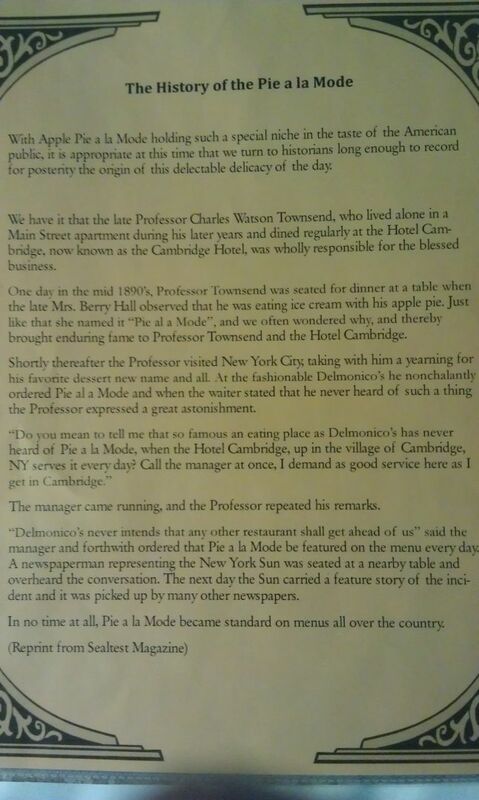 The AP article doesn’t cite any evidence beyond the hotel’s questionable claim to be the birthplace of pie à la mode. Well, Townsend may have ordered the dish “52 years” before he died (that is, in 1884), but not at the Cambridge Hotel, which was built in 1885 and closed in 2012. However, another account says the “blessed business” of the pie occurred in the mid-1890s. “With Apple Pie a la Mode holding such a special niche in the taste of the American public, it is appropriate at this time that we turn to historians long enough to record for posterity the origin of this delectable delicacy of the day. “We have it that the late Professor Charles Watson Townsend, who lived alone in a Main Street apartment during his later years and dined regularly at the Hotel Cambridge, now known as the Cambridge Hotel, was wholly responsible for the blessed business. The hotel characterized this account as a “Reprint from Sealtest Magazine.” No date was given, but the Sealtest Dairy didn’t exist until dozens of years after the events described. Sealtest began life in 1935 as a research division of National Dairy Products, which was founded in 1923. The hotel also passed along the story to the Ice Cream Review magazine in 1951, and it was later picked up by newspapers, websites, and other news media. In our own searches of newspaper and literary databases, we could find no written evidence from the 19th century to support the claims that Townsend ordered pie à la mode in the 1880s or ’90s, or that Mrs. Hall suggested the name “pie à la mode” at that time. The primary source for the story that Gieriet created pie à la mode in Duluth is a local historian, Mike Flaherty, who wrote a March 1, 2012, report that’s on file with the Duluth Public Library. Flaherty’s report was cited on Wikipedia’s “Pie a la mode” page on March 27, 2013, and the so-called inventor of the dessert was changed on the page from Townsend to Gieriet on April 2, 2013. In his unpublished report, which the Duluth library copied for us, Flaherty says pie à la mode is believed to have been invented on March 26, 1885, at the grand opening of the Hotel La Perl on West Superior Street in Duluth. Flaherty discussed this in a May 21, 2013, interview with the Fox News TV station in the Twin Ports area of Duluth, Minn., and Superior, Wis. He based his claims primarily on a May 23, 1936, article in the St. Paul Pioneer Press and an advertisement in the March 26, 1885, issue of the Duluth Daily Tribune. But neither item said John Gieriet invented or named pie à la mode. “However, there is some doubt as to where the distinction for this discovery really belongs, for Minnesota has a candidate,” the article says. Like the AP article, however, the one in the Pioneer Press doesn’t offer any evidence to support the claim that pie à la mode originated in Duluth in the 1880s or that it was pronounced “pylie mode” at the time. And it doesn’t mention John Gieriet, who supposedly invented and named pie à la mode. The Hotel La Perl, formerly the Commercial, will be ready to receive guests Thursday, March 26th. The opening will be celebrated with a palatable dinner, from 12 o’clock till 2:30. A hearty welcome is tendered to the people of Duluth by the proprietor. Gieriet sold the hotel a year later when his wife became ill, according to an article in the Aug. 13, 1886, issue of the Duluth Weekly Tribune. If the date 1886 rings a bell, it’s because (as we mentioned earlier) the term “à la mode” was used in Duluth that year to refer to a meringue pie topped with whipped cream, not ice cream.